Thick black puddles and a looted, leaking ruin are all that remain of the Thar Jath oil treatment facility, once a crucial part of South Sudan's mainstay industry. Lying deep in the bush and swamps of Unity State, far north of the capital Juba, Thar Jath was once a collecting and processing point for crude oil pumped out of nearby wells and on to the Red Sea coast of Sudan for export to oil-thirsty Asian economies. 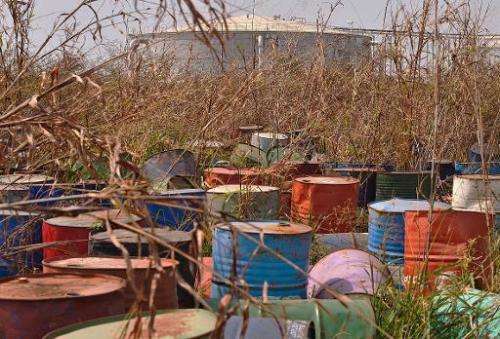 Like many other oil wells and facilities across the north of the world's youngest country, it has been ransacked since the outbreak of civil war in December 2013. Pro-government troops, rebel fighters and ethnic militia are fighting hard for their share of power and the country's oil wealth. During nearly 15-months of war between President Salva Kiir and his former deputy Riek Machar, South Sudan's oil exports have tumbled by roughly a third to a half. The impact of the conflict has been worsened by falling global oil prices dealing a near-mortal blow to the economy of one of the world's poorest countries. And with workers having fled many facilities, oil now also represents a severe environmental hazard. "The situation is very worrying," said Klaus Stieglitz of Sign of Hope, a German aid group which operates in both rebel and government-controlled parts of the country. "The next rainy season can allow what is up-to-now contained oil to spill over. The oil is seeping into the water table." Standing at Thar Jath, Stieglitz pointed to a football field-sized pit near the plant: "It's a large amount of oil in a hole that is not isolated from the ground. It adds, in a dramatic way, to the contamination of drinking water that was already here." Samples taken by Sign of Hope between 2009 and 2013—even before the war broke out—revealed the contamination of groundwater by oil activities in the area. The aid group said it is now investigating reports of birth defects and other serious illnesses. 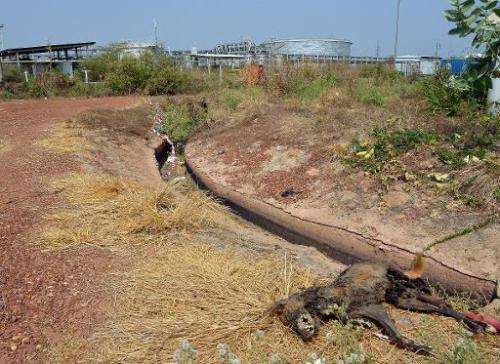 The Thar Jath oil treatment facility, which handled oil from surrounding wells operated by the consortium SPOC (Sudd Petroleum Operating Company), led by the Malaysian giant Petronas, was abandoned days after the war broke out. Inside, the offices are smashed up and strewn with documents, the control centre is ransacked, while outside the pipes have been battered. Barrels of chemicals leak into the dirt, and a strong smell of oil cloys the air. It is unclear who destroyed the plant. Thar Jath is currently under the control of Machar's rebels but in the to-and-fro of both sides have been accused of scorched earth tactics before ceding territory to rival fighters. "We are very worried about this issue of oil," said George Gatloy Kong, an opposition leader in charge of liaison with NGOs in Unity State, speaking of Thar Jath. Local authorities also say the uncontrolled growth of thick, dry vegetation in and around the plant could spark a dangerous inferno: "This now dry grass can set the facility on fire," said Majil Thay Woor, a deputy county commissioner. At Rier, one of the worst-affected villages, tests of the local water well have shown high levels of unpalatable salt and poisonous lead. 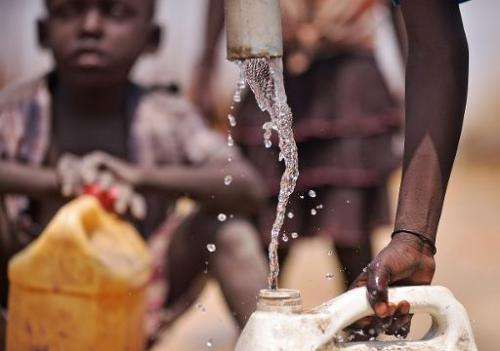 "This water is too salty... the taste is too bad," said Agar Jok, 35, a mother of eight. She said people who drink from the well end up vomiting or contracting diarrhoea, especially the children. For drinking water, Agar Jok now walks for two hours, twice a day, to fetch water from a small tributary of the White Nile. She carries the water on her head, 20 litres in the morning and 20 litres in the evening.